China is a world leader in e-sports even as the government remains suspicious of video games. 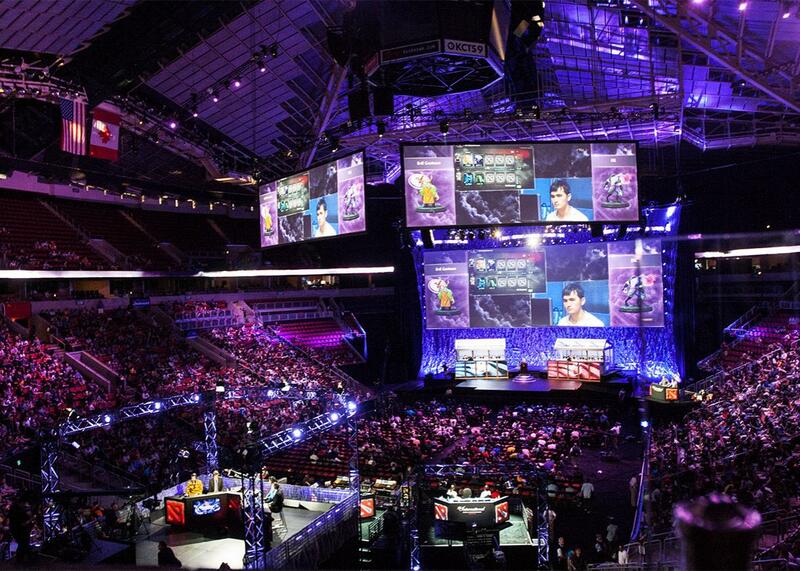 The stage and crowd at KeyArena for an e-sports event in 2014. This article is part of Future Tense, a collaboration among Arizona State University, New America, and Slate. On the evening of Tuesday, April 5, Future Tense will host a discussion in New York about the rise of e-sports. For more information and to RSVP, visit the New America website. In 2008, two professional athletes carried the Olympic torch through Hainan as it made its way to Beijing. These two young men, known to their fans as Sky and Moon, did not look particularly athletic. They were not muscular, and their pale complexions suggested that they spent little time outdoors. For online game aficionados, however, this moment represented a victory on the path to official recognition and respect for the sport they hold most dear. In 2003, when the Chinese government first recognized e-sports as an official sports program to be overseen by the General Administration of Sport of China, Sky and Moon were already famous for playing the real-time strategy game Warcraft III. To this day, Warcraft III has a devoted following in China, while newer titles, such as League of Legends, DOTA2, CrossFire, and Starcraft II, have captured the attention of younger gamers. Gamers who do well in local competitions or have the highest scores on public servers now have a chance of being recruited to professional, corporately sponsored teams. Professional gamers are salaried—though they lack a safety net should they not perform to expectations—and competitions are held in large stadiums with prize pools totaling millions of U.S. dollars. The 2012 and 2013 World Cyber Games, hosted in Kunshan, China, brought in a reported 110,000 and 155,000 live spectators, respectively, while CEO Brad Lee boasted that the program attracted 150 million online viewers. When not attending live competitions, fans watch replays of competitions online, follow their favorite players’ official WeChat accounts, and purchase merchandise emblazoned with the logos of their teams of choice. The China Internet Network Information Center estimates that close to 400 million Chinese citizens play online games. A good number of these gamers grew up in the late 1980s and 1990s, a time when playing PC games in Internet cafes was a way to assert independence. Chinese youth are subject to a rigid schooling system, in which success on a single college entrance exam is the sole factor that determines college admissions. Parents and schools often restrict extracurricular activities, focusing on test prep above all else. As such, playing games is the quintessential form of Chinese teenage rebellion, not unlike underage drinking in the United States. The Chinese e-sports industry has, as a result, been plagued by the public’s overwhelmingly negative response to digital gaming, one that has been exacerbated by a media moral panic over Internet addiction. At professional tournaments, it is not uncommon to hear government officials openly proclaim that gaming has a negative effect on youth. For example, during a press conference for the 2012 World Cyber Games, I heard a local official remark that her husband forbade her son to attend the competition, fearing that it would impact his studies. As such, e-sports marketers have made a concerted effort to separate “healthy” e-sports games from those deemed unhealthy and “addictive.” At the Esports Champion League tournament held in Beijing in 2010, an official opened the competition by declaring that, “e-sports [dianzi jingji] is a sport, it must be strictly separated from Internet [wangluo] games.” This separation has carried over into the language used by average gamers, who often insist upon a division between “e-sports” and other “addictive and wasteful” “Internet games,” such as massively multiplayer online role-playing games like World of Warcraft. In spite of this carefully constructed division, SARFT still bans the broadcast of video gaming, including e-sports, on public television channels. So how does a country that bans television broadcasts of digital games and sends young gamers to Internet addiction rehabilitation camps become a leader in the emergent field of e-sports? In recent years, “soft power” (ruan shili) has become a buzzword for the government. President Xi Jinping has used the term in his official speeches and as the theoretical foundation for the “China Dream”—an amorphous concept that encapsulates neoliberal market principles, eco-conscious lifestyle aspirations, and traditional Chinese values. Soft power, a concept originally developed by scholar Joseph Nye, references a country’s cultural as opposed to military might. Japan, South Korea, Taiwan, and Hong Kong have become leaders in this arena, with video games, anime, martial arts films, popular music, and television series from those countries gaining large followings across the globe. By contrast, mainland Chinese popular culture has largely failed to break into the global market. By tapping into the potential of their vast population of PC and Internet gamers and branding China as a major player in the digital gaming market, China may well have hit upon a strategy for rectifying this cultural imbalance. The Chinese government has also used e-sports tournaments to draw tourism and positive press to locations that have received little of either. There have been high-profile competitions in off-the-beaten-path locations such as Kunshan, a technology and manufacturing hub south of Shanghai, and Yinchuan, the capital of the remote Northwestern province of Ningxia. If Kunshan’s name is familiar, it’s likely because of international press surrounding the Foxconn factories, one of the locations where Apple products such as iPhones are manufactured. In 2010, the factories gained notoriety for a series of suicides in which workers threw themselves from rooftops. The factory’s chilling response: nets to prevent jumpers from making successful attempts. By hosting global e-sports events in these lesser-known regions and refocusing global attention on digital leisure, the government is trying to rebrand China as a tech-savvy nation that has as much of a stake in the tech entertainment industry as it does in the tech manufacturing industry. As of now, though, the triumphant image of the e-sports heroes carrying the torch of the “China Dream” remains tempered by the reality of Chinese teenagers who play Internet games despite the stigma of addiction, not to mention the tech workers who labor to produce the very devices on which the games are played.